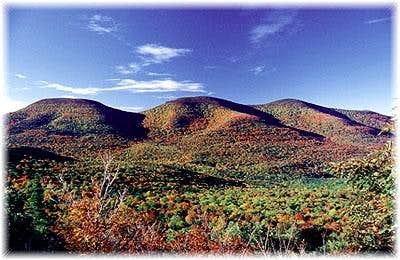 Black Dome is the central peak in the Blackhead Range, located in the northern Catskills. From the summit, there are views south to the southern Catskills. Access from the west is via the Black Dome Range Trail from Maplecrest. This trail provides a fine long climb over the western part of the range, passing over Thomas Cole enroute to Black Dome. From the east, access is via the Black Dome Range Trail from Big Hollow. The climb is gradual untill Lockwood Gap between Blackhead and Black Dome. From Lockwood Gap to the summit, the climb is very steep. Exit the NYS Thruway at exit 20; turn left onto Route 32 at the light. Head West over the Thruway for 0.2 of a mile. Follow route 32 for a total of 6.2 miles at which time you will want to stay left on route 32A at the “Y”. Follow this to Palenville for 1.9 miles at which time you will want to stay left on 23A at the “Y”. Follow route 23A for 6.8 miles while passing through Haines Falls to the Town of Tannersville. At the only (as of 2002) traffic light in Tannersville turn right on route 23C (Hill Street- north) for 2.1miles to a “Y” intersection and the All Souls Church, stay left for another 1.1 miles (down hill) to East Jewett. Continue straight for another 2.9 miles to county route 40. Turn Right on route 40 towards Maple Crest. Head north for 1.9 miles on route 40 to Maple Crest. Stay right onto county route 56, Big Hollow Road (route 40 bears Left to Hensonville). Follow Big Hollow Road for 4.3 miles to the end and the Trailhead. Exit the NYS Thruway at exit 20; turn left onto Route 32 at the light. Head West over the Thruway for 0.2 of a mile. Follow route 32 for a total of 6.2 miles at which time you will want to stay left on route 32A at the “Y”. Follow this to Palenville for 1.9 miles at which time you will want to stay left on 23A at the “Y”. Follow route 23A for 6.8 miles while passing through Haines Falls to the Town of Tannersville. At the only (as of 2002) traffic light in Tannersville turn right on route 23C (Hill Street- north) for 2.1miles to a “Y” intersection and the All Souls Church, stay left for another 1.1 miles (down hill) to East Jewett. Continue straight for another 2.9 miles to county route 40. Turn Right on route 40 towards Maple Crest. Head north for 1.6 miles to Barnum Road, turn right on Barnum road. Follow Barnum road east for 1.1 miles to the end and the Trailhead. Red Tape and info about Back Country Camping. If looking for a place to stay and have a guided ride contact Mountain Bike Inn and ask for Ernie. Tell him Rik sent you, either you'll get a deal or a screwing. Regardless of the out come you'll have fun. For information about the Long Path Trail from Phoenicia to Windham click here. Post your summit mugshot here. Special thanks to grandwazoo for his original submission of this beautiful mountain. Trail mileage and description for the trail to Thomas Cole, Black Dome, and Blackhead.